D'aww, our little Mana is a relentless and family destroying dictator~. 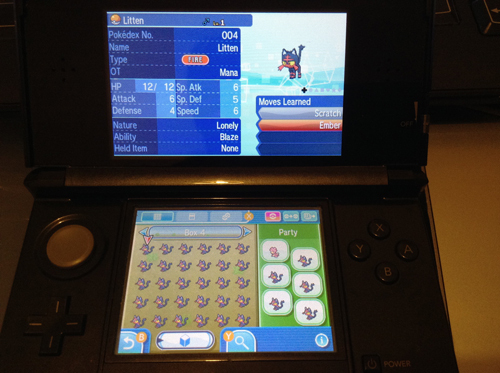 That being said, if anyone wants a Litten, let me know. give me a sec and i`ll send a rowlett(cant spell it correctly) and some other aloan pokemon i get. btw aloan ninetails is NOT avalible in pokemon sun or until after you beat the league.....also i need a electric type if you happen to come across one. i have a team with a full thing ofweakness to flying. So cruel in fact I'll have to bookmark for later so I can recreate it in order to prove how cruel this act is. I wasn't even at endgame and ended up with one of the ultra beasts (The electric one) from wonder trade. If you want it Daz, go for it. Just noticed the box name, very creative my friend, very creative.